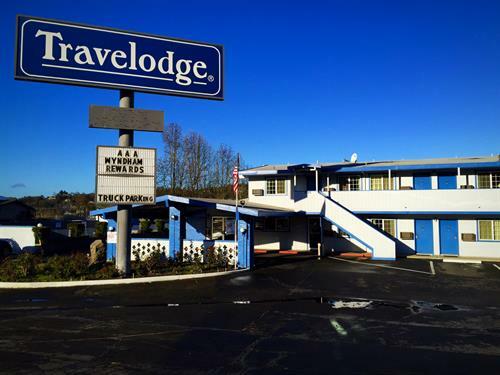 Surrounded by majestic mountains, Grants Pass Travelodge motel is at the doorstep of many exciting area attractions. Located in between Redwood National Park and Crater Lake National park this motel is also great for your adventures to Wildlife Images, Hellgate Jetboat, and much much more. 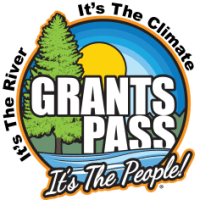 Right off Interstate 5, our hotel has free parking for your cars, trucks or RVs so you can easily explore the area. There are two electric car charging stations directly in front of our motel and four Tesla charging stations set up right across the parking lot. Our friendly front desk staff is here around the clock to help make your stay memorable. Start your day with free Bear Bites continental breakfast and warm coffee before going on that long awaited hike or swimming in our seasonal outdoor pool. Update friends and family on your trip with free Wi-Fi Internet access throughout the entire motel or by using the lobby computer. Our pet-friendly hotel offers suite, non-smoking and smoking rooms for your convenience. We also have a laundry facility with vending machines that offer snacks and refreshments. I-5 North and South: Take exit 58 for Oregon99/Redwood Hwy toward U.S. 199/Grants Pass/City Center. Merge onto N.W. 6th St. Turn right into Travelodge Motel(same parking lot as Black Bear Diner).